I subscribe to this Google Group that discusses power and cycling training. 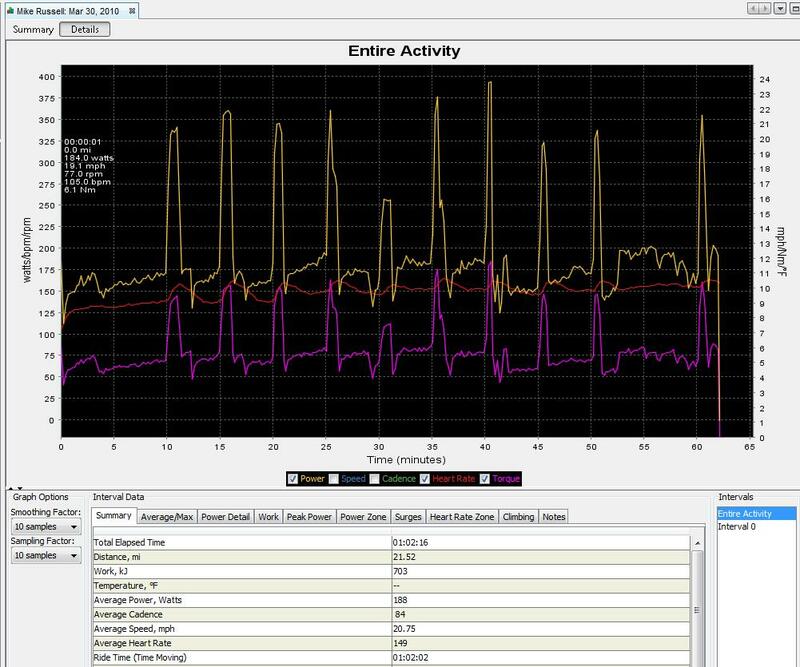 One of the recent threads discussed the best way to improve your overall power outputs and the conversation turned to the idea of doing these intervals at 150% of your FTP. Because I am trying to get my climbing legs optimized for St. George I have been doing some really tough intervals, but these caught my eye. This is a tough workout that I would recommend you put into your schedule at least once a week. It simulates the climbing of Ironman St. George well, but it also helps you find your pain threshold. I also swam last night and didn’t get a chance to post about it. It was a quick 10 x 100 workout at 1:10 pace. with about :45 seconds of rest between each set. By the end of the workout, I thought my shoulders were going to explode. I focused on form and consistent effort and I felt solid the entire time. Like I said, it was a quick workout, but I think it helped my keep my form sharp. I will have two 4,000 yard workouts by the end of the week. I am constantly impressed by the effort and time you put into your training. I can not wait to hear about the end result! I really hope you rock out St. George.